Whether for hobbyists or professional shufflers, The Shuffleboard Federation has all the top shuffleboard tables and shuffleboard supplies required for high-stakes gameplay. No matter if you're looking for residential, custom-made or coin-operated shuffleboard tables, The Shuffleboard Federation has every option imaginable to help you find the best fit for your unique needs and environment. We're enthusiastic shufflers ourselves at The Shuffleboard Federation, so we know the ins and outs of the game and are happy to be a trusted retailer of new shuffleboards and antique shuffleboards alike. Our selection of premium-quality shuffleboard tables includes hand-crafted, American-made models by reliable makers, like Heirloom, Venture, Hudson and Champion. Longtime brands like Venture and Champion provide the best in quality and value, while specialty makers like Heirloom offer stunning vintage-inspired shuffleboards that can be passed from generation to generation. We have a table shuffleboard that honors the official shuffleboard table dimensions (22 feet long) as well as smaller, more compact models that are ideal for home game rooms, dens, offices, basements and even porches and patios. Styles include sleek, modern shuffleboards as well as ornate, traditional designs to help match your home or business' interior decor. The Shuffleboard Federation also specializes in custom-made shuffleboard tables and antique shuffleboard tables, including Rock-Ola shuffleboard tables, to help meet the needs of even the most specific shoppers. 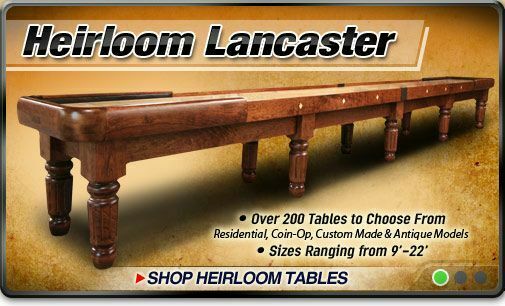 Customizing your shuffleboard table is simple and comprehensive at The Shuffleboard Federation, as you can opt to add lighting, scoreboards, pin gates, coin-operated mechanisms and much more to many of these tables. Most styles also come with the option to tailor the finish - and sometimes the wood species - to your preferences. Some boards can even be treated for outdoor use, making them great for fresh-air gaming spaces. Once you choose your ideal table, be sure to browse our impressive assortment of shuffleboard supplies. We have everything you need to keep your table in tip-top shape, including shuffleboard waxes, board wipes and cleaning supplies, shuffleboard tournament books and even a Deluxe Accessory Package that includes all of this and more for one low price. This is the best gift for shuffleboard players and enthusiasts alike. You'll also enjoy our grade-A assortment of shuffleboard memorabilia, including collectible shuffleboard posters and prints that are a must for the game room. Our full selection of shuffleboard weights, pucks and cases includes the industry's leading brands, like Pro Series and Venture, for quality you can trust. We hand-select the finest quality shuffleboard pucks that meet rigorous standards in style, durability and craftsmanship, so you can rest easy knowing you're getting a long-lasting product when you shop with The Shuffleboard Federation. Additional accessories and essentials, like scoreboards, lights and shuffleboard table covers, will help you keep your table looking great and operating at a professional level. When you shop at The Shuffleboard Federation, you know you're getting the absolute lowest prices on shuffleboard tables and supplies, as we always offer a low-price guarantee. You'll also get fast and free shipping with every order over $40, and can always call our friendly customer service line at 800-380-3033 if you have any questions regarding the items we sell.